Heat oven to 350°F. Place paper baking cup in each of 24 regular-size muffin cups, grease bottom and sides of muffin cups with shortening and lightly flour, or spray with baking spray with flour. In medium bowl, mix flour, baking powder and salt; set aside. In large bowl, beat butter with electric mixer on medium speed 30 seconds. Gradually add granulated sugar, about 1/4 cup at a time, beating well after each addition and scraping bowl occasionally. Beat 2 minutes longer. Add eggs, one at a time, beating well after each addition. Beat in vanilla. On low speed, alternately add flour mixture, about 1/3 of mixture at a time, and milk, about 1/2 at a time, beating just until blended. Stir in butterscotch chips. Divide batter evenly among muffin cups, filling each with about 3 tablespoons batter or until 2/3 to 3/4 full. Bake 20 to 25 minutes or until golden brown and toothpick inserted in center comes out clean. Cool in pans 5 minutes. Remove cupcakes from pans; place on cooling racks. Cool completely, about 30 minutes. Meanwhile, in 2-quart saucepan, melt 1/2 cup butter over medium heat. Stir in brown sugar with whisk. Heat to boiling, stirring constantly. Stir in 1/4 cup milk. Return to boiling. Remove from heat; cool until lukewarm, about 30 minutes. Gradually stir in powdered sugar. Frost cooled cupcakes. Sprinkle each with kosher salt. No Kosher salt? 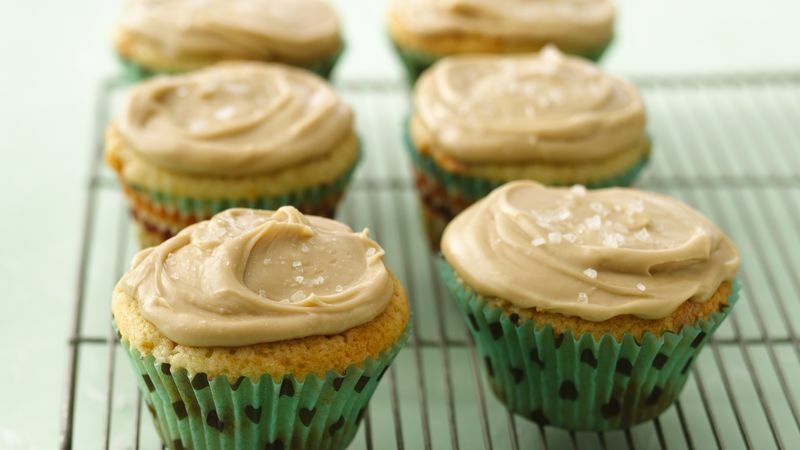 Try sprinkling chopped salted peanuts on the frosting.